Excuse me while I dabble in the brief dalliance that is Valentine’s blogging. While the entire nation has gone into a frenzy over themed boxes of chocolates, flower bouquets that struggle to fit through the door (or a mysterious single red rose) and hundreds of variations of sickly sweet cards, I’m turning my hand to February treats in the form of jewellery, the ultimate Valentine’s treat. 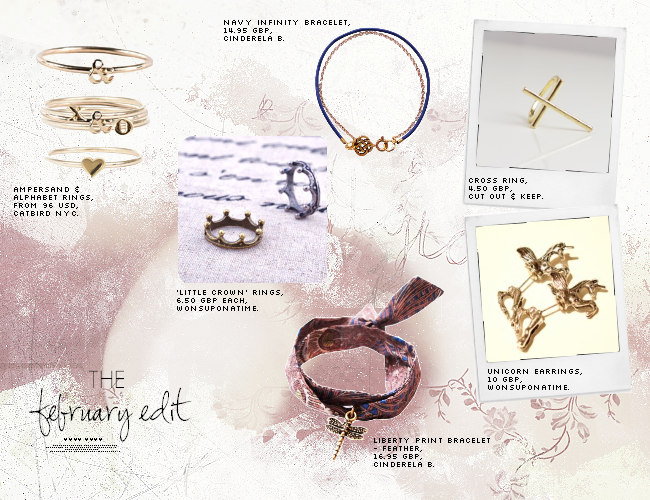 The February Jewellery Edit: featuring Catbird, Wonsuponatime, Cut Out & Keep and Cinderela B. Whether you’re buying for yourself or are planning on propping this page up on your iPad for your boyfriend to see, I love nothing more than a good jewellery edit. (Olivia Palermo, I haven’t forgotten your stint as ELLE US’s Accessories Editor that started this little ‘thing’…) As of late, I’m toning down all things jewellery to the bare basics: simple rings, the most delicate of bracelets and understated necklaces are on the menu here. Catbird is one of the newest additions to my bookmarks tab. Housing a 100+ strong, meticulously curated selection of jewellery, I’ve already earmarked the Ampersand Ring as my birthday ring. I’m dreaming of early spring days with little stacked rings on my equally as little fingers, paired with a thin gold chain around the wrist, a crisp white shirt dress and Charlotte Olympia flats. For something a little more affordable on the jewellery spectrum though, I set to work with sifting through the independent and smaller boutiques to find some must-haves. Wonsuponatime is one of my favourite online jewellery shops. Sarah is easily one of the sweetest people in the community, and she began this venture last summer, full of whimsical and fairytale offerings. The Little Crown Rings and Unicorn Earrings are all perfect Pandora’s Box additions! In a similar vein, Gemma opened her new store (Cut Out & Keep) last week and it is the perfect, well thought out edit of lifestyle and fashion must-haves. This print and delicate Cross Ring are great for more directional Valentine’s gifts/treats.